Ok so i think we have all seen White, Silver, Black and Blue Altezzas either on the road or in carparks, But how many time's have we seen a mint gunmetal grey Altezza ? ? I myself have never seen one untill Japfest last year when Roundymoony had his car on the tezzaworld stand. I was taken with the colour, the wheels and the style. It really is a rare Altezza on this Island. Hard to say, there are too many to just pick one. Oh, Nearly 3 Years now. A lot of it is my own work. 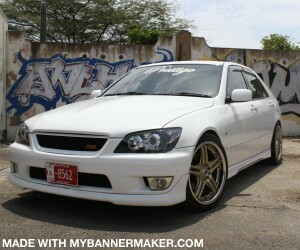 My car’s not over modified but the touches I have put to it are to make it different and to make it my own. No, I’m pretty happy with it all at the moment. Engine maybe or the body slightly, I think if I do one I’ll do the other . Mainly Toyota and the Auto factors, But after seeing the feedback about Nick on site, I think I’ll be getting parts from him from now on. Does price or quality make a difference when choosing parts for the Altezza, like if it’s cheaper to get the same part from Japan or USA than here would you buy it? Quality first. I believe you get what you pay for. No I have never had it on a dyno. Have you ever had your Altezza on a track? If so where and what kind of times did you have? Does your other half know how much money you have spent on the car? Nobody knows!! I even keep it a secret from myself . What is the worst mod you have seen on an Altezza? Not seen too many awful mods on Altezza’s, but seeing more and more abused examples around and for sale. What cars or car have you had before the Altezza? What kind of driving do you do in your car every week, is it a weekend toy or an everyday car? It’s mostly the weekends, as I have a run around to get to work. probably my favourite altezza in the country, not over done just perfect , great write up too. beautiful car, didnt realise how sweet it looked until japfest. Stunning car! !...and im in love with the front bumper!! Damo u should make ATEZZA - TUNING magazine . lovely pic,good questions,u can be writer. i love to hear about-max speed.bhp.torgue,acceleration. and when is our tezza on first page? As I said Saturday buddy, It's a mint car , , Looks well. .
this car is easily one of mhy favourite on the site, and looks better in the flesh!! its mint lad far play to ye! One of the best looking tezza's I've ever seen hands down. And another tremendously put together monthly feature, nice job Damok. Good stuff. I get to see a mint gun metal one myself when I look out the window ha ha . Well done on another great write up.